No matter if you’re an experienced kayaker, or novice boater there are opportunities for everyone on Fort Wayne’s three rivers. 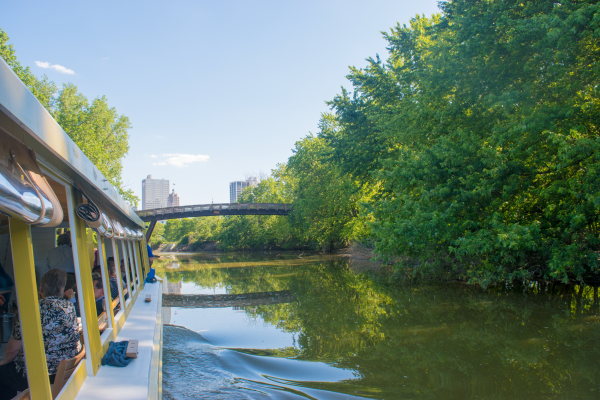 Sit back, relax, and leisurely explore Fort Wayne’s rivers with a boat tour. Choose between airboat rides, historical tours, party barges, canal boat tours, and free river excursions. Keep in mind, free river excursions are only offered as a part of the Three Rivers Festival, and all other boat tours and rides require payment. 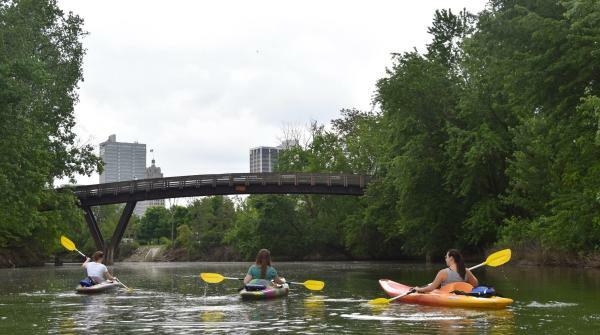 To get out on Fort Wayne’s three rivers yourself, rent a kayak, canoe, or standup paddleboard. Take one of our water trails provided by Northeast Indiana Water Trails or create your own route - just be sure to consult with the Fort Wayne Outfitters staff who know Fort Wayne’s rivers well and can help you steer a clear route. If you want to make a trip without having to paddle back to your car, book a paddle trip with Fort Wayne Outfitters who will transport you and the equipment to a drop in point! Hiking is always free, so consider lacing up your shoes to discover the beautiful trails along Fort Wayne’s riverfront including the Rivergreenway trail. Fort Wayne has over 100 miles of trails that connect you to shopping, dining, entertainment, and more! Rent or bring your own bike, and hit the pavement for some urban exploration and shady trail rides. Again, Fort Wayne&apos;s trails are the perfect route to let you explore the riverfront. Consider taking the Towpath Trail, a trail that follows the historic transportation route connecting you between the beautiful scenic marshlands to downtown Fort Wayne’s Rivergreenway. Rent a bike from Fort Wayne Outfitters. If you pack your own bike, secure it on one of the many bike rack sculptures located around Fort Wayne. The future of Fort Wayne’s riverfront is exciting and we can’t wait to enjoy the tree canopy trail, amphitheater, the new public spaces and ability to interact with the rivers in a new way. Stay tuned for more developments and information to come in Summer 2019! There is currently construction along the north and south banks of the St. Mary’s River near Fort Wayne Outfitters and the historic Wells Street Bridge. If you’re planning a trail ride or kayak trip near this area, keep in mind that some trails and roads may be closed. Before you plan your route make sure you check out this map for information on detours and closures. 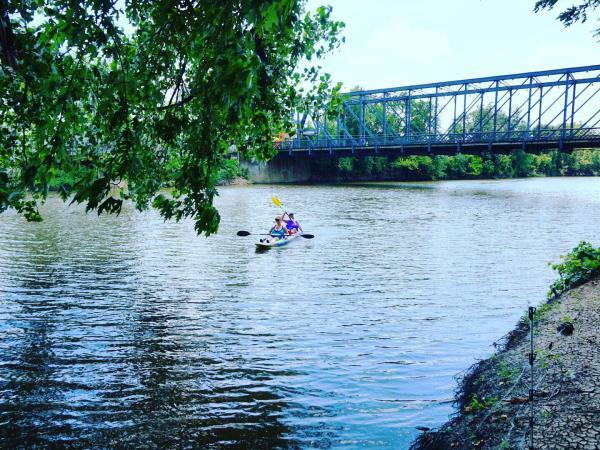 Bring your kayak or bike to enjoy Fort Wayne’s riverfront, or rent when you arrive from Fort Wayne Outfitters, which is conveniently located on the north bank of the St. Mary’s river. Wear appropriate clothing for kayaking, canoe, or paddleboarding. And, don’t forget your PFD (personal floatation device), sunglasses, sunscreen, paddles, and whatever you’d need while enjoying Fort Wayne’s three rivers. If you’re renting from Fort Wayne Outfitters, PFDs will be available. If you’re looking to explore Fort Wayne’s rivers, the perfect starting point is in downtown Fort Wayne. 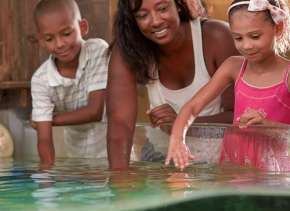 For those more experienced, consider Fort Wayne Outfitters excursions where they will drop you off, and you can paddle into downtown Fort Wayne. Renting a bike or watercraft from Fort Wayne Outfitters? Feel free to park in their parking lot. To access Fort Wayne Outfitters turn onto Cass road off of Wells Street and follow the road around to Fort Wayne Outfitters. If you’re dropping in your watercraft from a boat launch, most launches have parking available. For those that wish to drive into Fort Wayne and bike along Fort Wayne’s riverfront, we suggest parking near Headwaters Park in a surface lot or in any of the downtown parking garages. If you’re looking to park close to the rivers, consider parking at Lawton Park. *Parking near the Wells Street bridge and Calhoun is not available due to riverfront construction and road closures. As mentioned above, Fort Wayne Outfitters is a great stop for renting any gear you need while in Fort Wayne. Plus, their staff is very knowledgeable about the rivers and trails that help make our city so great! 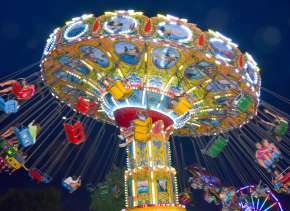 You can also rent from Earth Adventures Unlimited located on West Main Street. Boat ramps are located throughout Fort Wayne’s river system and provide you access to the St. Joseph, St. Mary’s and Maumee rivers. Some of the most popular launches include the Johnny Appleseed Park and Guildin. For a map and complete list visit the City of Fort Wayne site and the Leo Cedarville maps. It’s no secret that winters in Indiana are not easy, and spring can mean that the rivers are way too high to enjoy safely. If you’re planning a getaway to Fort Wayne and want to enjoy the rivers consider planning your trip from May through October. Earlier than May the rivers have yet to be lowered to safe levels. After October, the cold weather tends to set in and river levels will fluctuate naturally. In summer of 2019, expect to enjoy Phase I of Fort Wayne’s riverfront development to be completed - consider planning a getaway in late July or August to enjoy. Plus, stay tuned for when future phases begin. It’s a beautiful thing when urban living and outdoor adventure meet. In the heart of Fort Wayne, Indiana, of course. “The confluence of the three rivers was home to the capital of the Miami Nation, hosted several military and frontier forts, served as the summit of the Wabash-Erie Canal, and, now, is transforming Fort Wayne from an industrial powerhouse to a cutting-edge, creative capstone of the Midwest," says Megan Butler, Program & Events Manager for Riverfront Fort Wayne. From the historical significances of Fort Wayne’s waterways to the new opportunity of experiencing a natural feature in an urban destination, the St. Joseph, St. Mary’s, and Maumee are, and will be one of Fort Wayne’s defining destination asset. Now that you know a bit about Fort Wayne’s three rivers, we hope you get out there and explore. If you have a question consider some of these contacts while you’re in Fort Wayne! 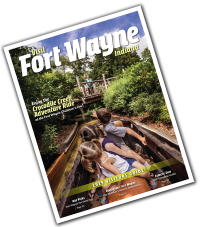 For urban explorers, outdoor adventure seekers, and leisure travelers Fort Wayne’s rivers provide a great addition to any trip. 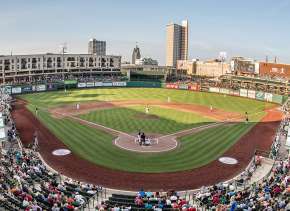 Start planning your getaway today, and consider staying in downtown Fort Wayne for the most convenient access to attractions, dining, shopping, events, and, of course, Fort Wayne’s three rivers.